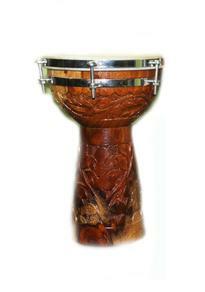 Meinl Wood Doumbeks are great sounding, lightweight wooden hand drums with decorative tribal carving on the foot. Goatskin heads are securely fastened over the Egyptian-style bearing rims, which is preferred for finger roll techniques. True authentic tone for an easy price. A decorative and well-performing drum from Meinl. Order today.